Before P.’s birthday, I showed you all my experiment in natural icing dyes and talked a bit about my feelings on the subject of making cool-looking cakes for the kids in the age of food dye awareness. I’m still not hypervigilant about every possible exposure they may have to artificial colorings, but I just can’t — in good conscience — want to make a birthday cake that requires me to goop up the frosting with a whole load of super-bright dye. If there’s a way to get around it, I’ll give that a shot…unless, perchance, it happens to involve mixing cabbage, spinach, and baking soda into the frosting, in which case I have to go lie down in a dark room and mutter to myself as I remember the good old days of my blissful ignorance about day-glo birthday cakes. For P.’s cake this year, with the requested Thomas and Percy theme, I felt I had a tricky task ahead of me to make something fun and whimsical WITHOUT the requisite blues, greens, and reds. However, I think I did pretty well, considering I’m no Ace of Cakes. This was the result — I made the landscape for the trains out of cake, but copped out a little bit as far as creative cake decorating challenges go by using P.’s actual trains as the finishing touch. As you can see, it’s not 100% dye-free, since I couldn’t resist sprinkling a bit of green decorating sugar over parts of the cake to mimic grass — but there was so little of that, in the grand scheme of things, that I didn’t feel too guilty about it. The cake itself was a new experiment, too — S’mores Cake. I made my standard, go-to chocolate cake batter with a few minor adjustments, then added miniature marshmallows and coarsely crushed graham cracker pieces. I baked the cake in a 9×13 pan and made the tunnel portion in a minature loaf pan, then hollowed out the middle of the cooled loaf. The cake was so rich and fudgy that J. and I agreed it needed a neutral icing, so I whipped up some vanilla buttercream, as you can see in the picture. 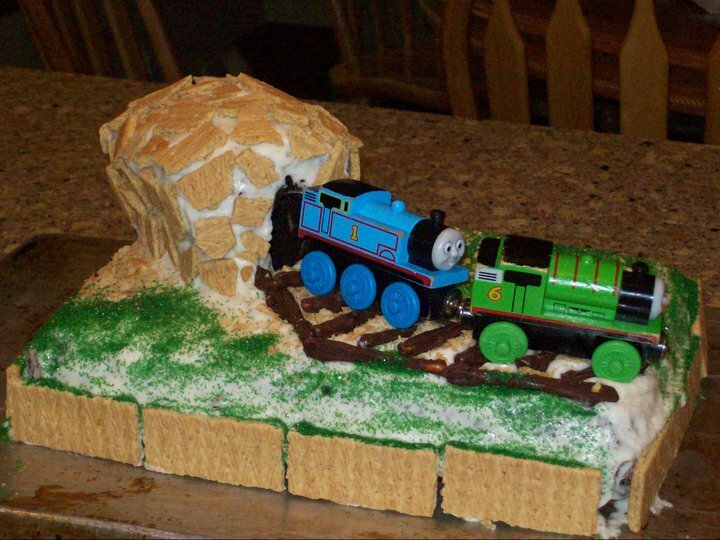 L. and I then decorated it together, using broken graham crackers as the “stonework” for the railroad tunnel and chocolate-covered pretzel sticks for the train tracks. We finished off our handiwork with strategic sprinklings of the green sugar, crushed graham crackers (which looked like dirt and pebbles), and rows of cracker halves around the outside for a neater-looking edge. Oh, yes, it was a total sugar bomb — and yes, it was COMPLETELY worth it. (Also, surprisingly easy to accomplish.) I may be conscious, even overly so at times, about my kids’ diets, but I fully embrace opportunities like birthdays as occasions for Big Treats. Since our food practices are dictated by philosophy, not by any medically necessary restrictions, I figure letting the boys dive into some “real-world” sweets and snacks — rarely — is not only fair, but probably a good way to safeguard against an eventual backlash in which they go nuts and stuff themselves with junk food the first chance they get. I want their relationship to food to be as healthy as the food itself, and as far as I’m concerned, that means letting everyone indulge from time to time. I think P. appreciated it. Don’t you? 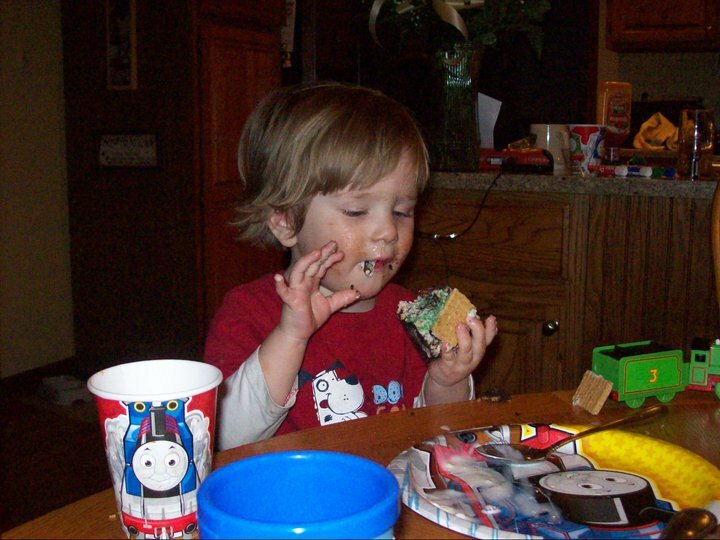 This entry was posted in Cooking, Feeding kids, Parenting and tagged baking, cooking, family, feeding kids, food, holidays, kids' health, milestones, parenting, party, recipes, sweets and treats. Bookmark the permalink.